The open terrain of the central Columbia Gorge reminds me of sub-alpine meadows in summer and invites exploration. The soil is still moist, and the grass is still green. Spring is here. The Washington side gets dry early, so it's good to see the water still cascading down the hillsides and the small pockets of marsh. Hiking on the old highway, it's evident why they moved the highway from this wall, as the old asphalt is strewn with debris. 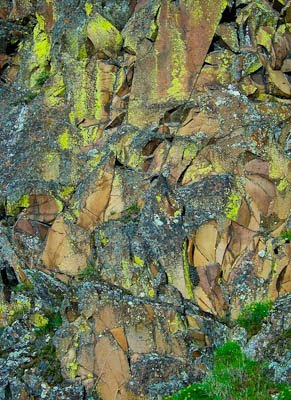 This rockfall leaves interesting, colorful patterns in the wall, with newly exposed rock next to older, weathered basalt. Wind and weather are harsh here. 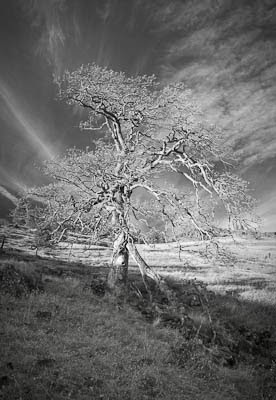 These meadows are scattered with old and weathered Oregon White Oak. They will be one of the last of the deciduous trees to bare their leaves, making sure winter is behind them. 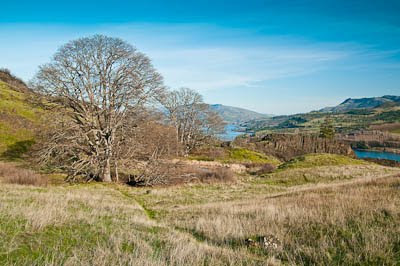 The area offers fine views of the Columbia River with relatively gentle walking. The trails are shared mostly with mountain bikers and other hikers. Far few people are here during the week. It's quiet and peaceful. All the mountain bikers and hikers have left as I return. 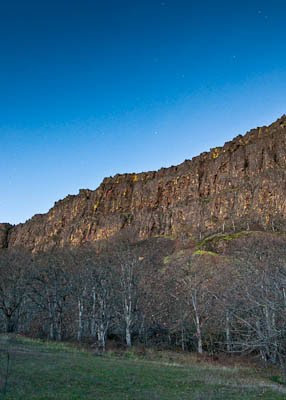 Coyote Wall wears different colors as the stars appear after dusk.